A step-by-step tutorial for steaming clams. There are many, many ways to cook and prepare clams. In fact, on occasion they are even eaten raw. 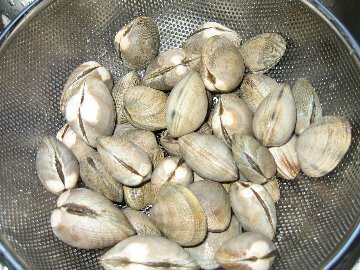 The steam-method for cooking clams is excellent for cooking small to medium-sized varieties of clam. We have selected the more common littleneck clams to illustrate how clams can be steamed. 1. To cook clams using this method, you will need at least 1 pound clams, 1/4 cup Narragansett lager beer, 1 teaspoon minced garlic, and 1 tablespoon butter. Cooking already cleaned clams with this method will take 3 to 4 minutes. 2. Preheat a large saucepan to a medium heat. Melt the butter in the saucepan, and stir in the garlic. Cook the garlic until it reaches a tan color. Be careful not to burn the garlic. If the garlic is overcooked or burned, throw out both the fat and the garlic, then wipe out the pan and start over. 3. Pour clams into the saucepan. Do not add too many clams to the pan at once. If the clams are stacked on top of each other, the weight of the other clams will make it more difficult for the clams on the bottom to open. With this method, you should only cook enough clams to cover the bottom of the pan. Stir the clams around in the garlic butter until the shells are coated, this will evenly distribute the heat within shells. 4. Once the clams have been coated, add about 1/4 cup of ‘Gansett per dozen clams. This creates the necessary steam required to open the shells. It will also decrease the overall heat within the pan. Cover the clams with a lid. When covered, the garlic is less likely to burn, and the clams will receive heat evenly from all sides. The clams are now being steamed. 5. After about 4 minutes, remove the lid. Most, if not all of the clams should be open. Clams, unlike mussels, only open when they are cooked all of the way through. If some of the clams have not opened, it is possible that either they were not cooked long enough, or that they are bad and should be discarded. Be careful not to cook the clams for too long, as overcooked clams are tough and unpleasant to eat. 6. When clams open, they release natural clam juice. This juice is often used as a base for items like Clam Chowder. We recommend serving the clams in their juice and accompanying the dish with slices of fresh bread to soak up the juices. Steamed clams can also be served over pasta.